It’s a little late this year, but I’ve got all the bees settling nicely into their hives. Once they’re really working, there’s nothing quite like the kind of calm you get, just sitting there, on a lawn chair in front of your beehive, just watching them coming and going, bringing nectar in, sending foragers out, a whole world of perfectly-choreographed activity laid plain. What a busy couple of months it’s been! I’ve been working hard at my no-longer-new job with the Baltimore Office of Promotion & The Arts, where I am facility manager for two of Baltimore’s architectural and artistic treasures, the Bromo Seltzer Arts Tower and the School 33 Art Center. After three years of planning, grant-writing, engineering, and other detail work (much of which was done expertly before my tenure at the Tower, thanks to Kristin Grey, the brilliant staff at BOPA, and Azola and Associates), we restored the South face of the tower clock to full operation last month! Click here to watch a brief film of the project via Youtube (and please forgive my unusual state of awkward tongue-tiedness, as I was working with a bad cold that day, had been up since 3am, and wasn’t expecting to be on camera). I’m happy to have been able to have the rents reduced at the Tower, so that our working studio spaces for artists now start at $320 (compare with studio spaces throughout the region—you’ll be pleasantly surprised). It’s a great place to work, and an honor for me, being able to be a part of such a cornerstone of the city. I also formalized the small performance space we have on the 11th floor of the tower, with the gracious and tireless work of our own Barbara Bryan, and the Studio11 Theater is heading into its sixth month now, hosting our resident troupe, Unexpected Theater, as well as a wonderful bi-monthly reading series by the Upward Spiral group. It’s just a room, right now, seating thirty in the city skyline, but we’re working on adding lighting, blackout curtains, and a screen for films to make a real little theater on the West Side, so we can host musicians, poets, storytellers, actors, filmmakers, and other performance-based artists. Outside of the working world, I’ve been getting back to my music, writing, and performances after a bit of a break. 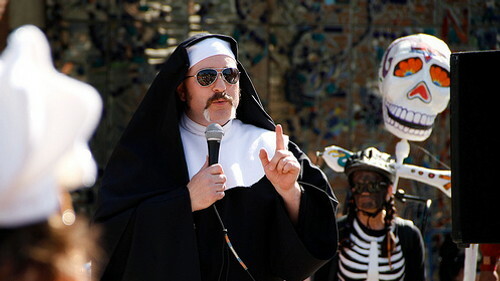 I debuted my new nitro-glycerine Nun character at the Kinetic Sculpture Race at my alma mater, the American Visionary Art Museum, on May 1st, 2010, kicking off the race with my usual inspirational message and disco-dancing celebration of the joys of being on the outside of everyday life. This was my 12th year as the spiritual advisor to the race, and it’s been such a great ride, writing these little hit-and-run routines over the years. Besides, dressing as a nun and riding a bicycle through the crowded city streets when you’re a husky fella with a mustache is just fun, and makes everyone smile. I could get used to this, but I don’t want to get in a rut, necessarily. I’ll be performing a short set of spoken word/ambient electronic music from 6:30-7pm on Saturday, June 26th, 2010 at the Hexagon in Baltimore, as a part of the Baltimore Electronic Music Summerfest 2010 (admission $6 for the entire event). I’m working on some additional performances for the rest of the year and will post them here (and on a calendar page I’m building for this website). The manuscript for my essay collection, Scaggsville, is coming along nicely, after a stretch of frustrating inactivity, and I’m hoping to have a micropress edition available by the autumn. Only three podcasts left in my ambient podcast, 12 Minute Travelogues, so sign up and enjoy! When I finish 12MT, I’m planning to create a remastered collection of the podcast, available on iTunes, Emusic, etc, and resume my older storytelling podcast. Watch the skies, as they say! I read a recent essay on WYPR 88.1 FM for their program, The Signal, and it airs at 12pm and 7pm today, 13 November 2009! If you’re not in the area, or if a radio’s not handy, you can go to the mp3 page at signalradio.org and listen online and/or subscribe to the program (which I heartily encourage—it’s a great show, and I’m not just saying that because I’m on it this week!). It’s been a radioactive time for me, with two appearances on the excellent program The Falling Room on CFBU 103.7 FM in Canada in the last month. I’m a huge radio fan, and an enthusiastic supporter of both public radio and college radio, so it’s great to have people track me down to share my work on the airwaves. I’m really hoping to get even more airtime in the next year, on traditional radio and the new media, as well. On that note, the next piece in my 12 Minute Travelogues podcast will be coming up soon, #9 in the series, and it’s going to be yet another evolution in the ongoing ambient experiment of the podcast. I try to do something a little different and find a new angle for each of these pieces, and if this one works out the way I’m expecting it to, it’ll be something else. Subscribe, if you haven’t already, and feel free to share the music with anyone you like—episodes of the podcast are released with a Creative Commons “attribution-noncommercial-share alike” license, which means you can share them with your friends, use them in your films and theater projects, and remix them for free, as long as it’s not for profit and you contact me and give proper attribution. As many of you may know, I’ve reluctantly left the American Visionary Art Museum, after quite a few successes, including the community mosaic project and my piece being on exhibit in the 2008-2009 show, Art, Science, and Philosophy. 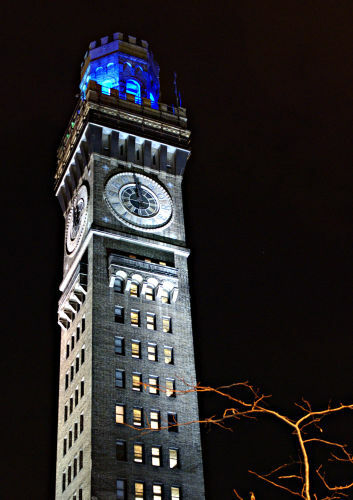 I had a great run with an amazing organization, but I’ve moved on to another of Baltimore’s architectural treasures (two, to be precise), managing the Bromo Seltzer Arts Tower and the School 33 Art Center. The Tower, where I have my office, is a fifteen-story clock tower that now houses high-end studio space for local artists (if you’re looking for a space, please contact me via the web site). I oversee leasing, maintenance, upgrades, and other aspects of keeping these two facilities running at full tilt, and, a month into the job, it’s a great place to work. The Tower hosts an open studio day once each month, when the building opens to the public to share the studios and work of our artists with the rest of the community. The next open studio will take place from 1-5 p.m. on Saturday, October 17th, 2009, at 21 S. Eutaw Street, Baltimore MD 21201, as a part of the city-wide School 33 Open Studios Tour. I hope to see some of you there, and encourage you to come meet our artists and go for a ride on our 1911 manually-operated Otis elevator. For a whirlwind look at where I work, take a look at the video. Hope I didn’t make you dizzy just then. Sadly, I can’t show you the clock room or the rooftop in person, owing to legal issues, but man, oh man, it’s neat up there in the secret parts of the Tower. The change in my working schedule has also had the effect of allowing me to resume my extracurricular activities, like my podcasts, my performance work, and my writing, which means I’ll be posting a lot more work here in the coming year. I’m particularly happy to have resumed the production of my ambient/deep listening music podcast, 12 Minute Travelogues, this month, and will be updating it monthly in October through January to complete the twelve-part series. I’m also working on getting my other podcast, Last Night I Dreamed I Was You, which highlights odd little stories with original music. The stories will be a little shorter than the first experimental episodes, but with thematic threads connecting multiple episodes into larger narratives. Look for the first new episode sometime towards the end of September. Work on Scaggsville is slowly resuming, as I undo a few overly-ambitious and misguided edits, with the aim of having a version of the book in print (the sonatext limited micro-edition) before the end of the year. Mind you, I’ve been hoping to hit the end of the year for a few years, so don’t count on the deadlines. It’ll be good, though, I promise. That’s about it for now, and thanks for visiting the site!